An important thing to be well referencend on search engines (is there anything different than Google? 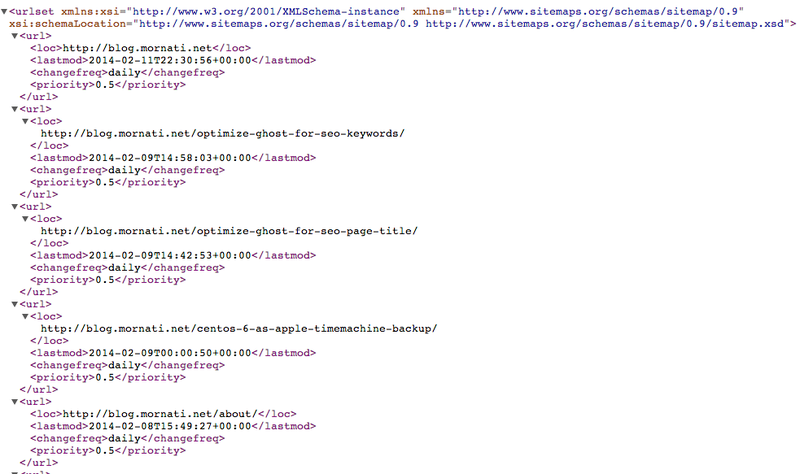 :D) is the sitemap.xml. In this file you should list all the pages of your website with some parameters to instruct the reader (the search engine robot for example) about the last update of a page, the update frequency and page priority. After some tests of scripts found on the net, I decided to create a specific sitemap generator for the Ghost blogging platform. The reasons is that all scripts I found and tests check for pages contactig Ghost thought the WebServer (asking for pages and checking for all links on each page). This is surely a good way to identify all pages and resources of your website automatically... BUT, it could take long time to be generated. In this way your sitemap is generated in a second. Actually the script works only for MySQL database (that is my actual installation), but with some little extensions we can add any other possible database. So, to use it, you can simply add a crontab with all required parameters to access to your Ghost DB and to generate the sitemap file. The user executing cron must have access to the sitemap folder (so normally should be: root/apache/nginx). Twe weeks ago I migrated my blog from Wordpress to Ghost platform. Even if actually I'm loosing some useful resource/util I loved in Wordpress, Ghost it's really awesome and easy to use.